In his film about water in El Salvador, filmmaker Jason Wallach asks if water is a human right or a commodity. Photo courtesy Jason Wallach. Graduate students in UCSC's Social Documentation master's program have focused their lenses and microphones on such pressing social issues as disability rights, health care, and hunger. Members of the Class of 2009 will present their works, which have been filmed, photographed, and recorded in Africa, Asia, Latin America, and across the United States, during two upcoming public events. On Friday, June 12, a public reception/gallery show will feature audio, photographic, and multimedia documentaries from 6-8 p.m. in Baskin Visual Arts, Rooms D-101, I-200, and J-101. On Saturday, June 13, video documentaries will take place from 1-6 p.m. in the Baskin Engineering Auditorium. Both events are free and open to the public, although attendees are encouraged to use public transportation if possible due to the limited parking options on campus during graduation weekend. Parking on Friday will be available at the Performing Arts Parking Lot, and on Saturday at the Core West Structure. Guests are advised to use the West Entrance and let attendants know they are on campus for the social documentation reception or screening. The Master of Arts in Social Documentation is a two-year graduate program focused on the development of expertise in the understanding and production of social documentaries in the genres of video, film, photography, audio, public ethnography, museum installation, and new media. "This is only the third year of the program, and already UCSC students are at the forefront of a new wave of documentarians," said Renee Tajima-Pena, associate professor of community studies. The foundation of the program lies in its social science approach to sociopolitical issues, prioritizing the graphic expression of people's lives and cultures, the conditions under which they work to sustain themselves, challenges to their survival, and strategies for improving their lives.
. The Pink Bubble by Valerie Krex, a film that tells the bittersweet tale of Mary Kay Cosmetics saleswoman Hannah Price, a mixed-race working mother whose quest to become middle class focuses on the ultimate symbol of Mary Kay success: the pink Cadillac.
. Photographer Amanda Abel's project, Closer to Home, documents the lives of people whose commitment to a sustainable lifestyle includes living in tiny homes (70-400 square feet per person).
. 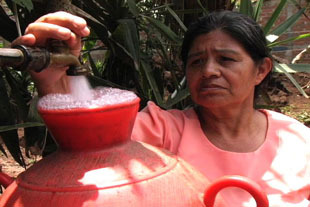 In Until the Last Drop: Tales from El Salvador's Agua-apocalypse, filmmaker Jason Wallach examines two visions of water management in El Salvador, where 40 percent of residents have no potable water in their homes. In El Salvador, which receives three times the world's average rainfall annually, is water a human right or a commodity to be bought and sold?
. Chris Newman's film Finding D-QU: The Lonely Struggle of California's only Tribal College documents the struggle to reopen D-Q University, which was shut down in 2005. The film explores stories of hope, healing, and conflict as supporters fight to hold on to a dream that was never fully realized. Graduates have also tackled global issues such as food security, gender-based killing, and access to health care; explored cultural tourism and the enforcement of normative body types; and documented the disability rights movement. Social Documentation Program, at (831) 459-4706 or rneighbo@ucsc.edu.